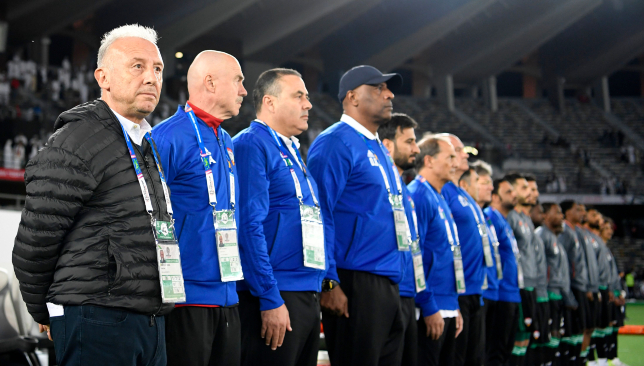 Coach Alberto Zaccheroni labelled super-sub Ahmed Khalil as “one of the best attackers” on the continent after he shook off his injury nightmare to perform a second rescue job for the UAE at Asian Cup 2019. Khalil, 27, smashed home a 103rd-minute penalty-kick to hand the hosts a 3-2 triumph against tournament-debutants Kyrgyzstan in the round of 16. This was the third, and final, time that they went ahead in a rollercoaster contest at a freezing Zayed Sport City on Monday. The 2015 AFC Player of the Year had previously held his nerve – upon his 100th cap – from 12 yards in the 88th minute of January 5’s Group A opener with Bahrain to salvage a 1-1 draw. After more than a season blighted by recurring fitness problems, Zaccheroni hailed the Shabab Al Ahli Dubai Club forward’s enduring impact. “Khalil is a very good striker,” said the ex-AC Milan and Japan boss, who next leads his adopted nation out against holders Australia on Friday at Al Ain’s state-of-the-art Hazza bin Zayed Stadium. “He is one of the best attackers in Asia. “As a coach, when I took over the UAE, Khalil was injured. He didn’t participate in any training sessions from the last season. “He hadn’t participate before the Gulf Cup, wasn’t ready at 100 per cent. “He was injured many times last year. He is a very good player and I count on him a lot. “He does so much with the national team, compared to the club. We try to make use of him in the games. Prior to the tournament’s kick-off, Khalil had last been available to feature in an official friendly for the UAE in September 11’s 3-0 triumph against Laos. Against Kyrgyzstan, Al Wasl anchor man Khamis Esmail headed in from a 14th-minute corner. His poor tracking, however, soon allowed playmaker Mirlan Murzaev to round goalkeeper Khalid Essa and score. Here's my report card after Ahmed Khalil was, again, spot on for the #UAE at #AsianCup2019. 2015 Asian Cup top scorer Ali Mabkhout moved onto three goals for this edition past the hour mark from a well-dispatched one-on-one. But substitute Tursunaly Rustamov headed in from a corner on 91 minutes to force extra time. Mabkhout would then be pulled down by wing-back Bekzhan Sagynbaev for the critical penalty. There was still time, however, for Rustamov to become the third Krygzstan player to rattle the woodwork, past the 120-minute point. Zaccheroni insisted that the UAE – who boasted 56-per-cent possession and 18 efforts to Kyrgyzstan’s 14 – made their own luck. The 65-year-old stated: “Yes, we scored with a penalty. The same against Bahrain. “Today, the UAE created some opportunities and scored goals. Our team was more aggressive and created lots of opportunities that were not all converted. “We had many attacks, involving three attackers – Ali Mabkhout, Ismail Matar, Khalfan Mubarak. Also, Khalil was added to the attack in extra time. Zaccheroni was previously at the helm of the Japan side who defeated Australia 1-0 in extra time during 2011’s final. He did not, however, know what to expect from imminent opponents who required a shootout to edge Uzbekistan, also on Monday. “Australia, I do not know anything about them,” said Zaccheroni. “It’s been a long time since I watched them. Only 17,784 supporters flocked into the 45,000-capacity ZSC for the Kyrgyzstan clash. Rather than apathy, Zaccheroni chose to blame the chilly weather for the low turnout. He said: “I agree that the stadium wasn’t completely full. But there were enough fans. “We’ve seen enough support. It wasn’t full maybe because it is cold and some fans prefer to watch the game on TV. The UAE finished third under Mahdi Ali at the 2015 edition. They then failed to make World Cup 2018. Ali Mabkhout scored one and won the penalty from which Ahmed Khalil (r) scored the UAE's winner. The UAE remain on course for a storied first-ever Asian Cup triumph as they edged past courageous Kyrgyzstan in the capital. Ali Mabkhout looked primed to be a predictable saviour for the host side when he coolly slotted home the winner after the White Falcons had threatened an upset at Zayed Sports City Stadium. Khamis Esmail headed the hosts in front before Mirlan Murzaev’s equaliser. Mabkhout made it 2-1 before the men in red equalised again with minutes remaining in normal time. Mabkhout was then adjudged to have been fouled in extra-time and substitute Ahmed Khalil fired home to make it 3-2. Here we analyse the performance of talismanic UAE striker Mabkhout. Midfield anchorman Esmail was a surprise scorer of the opening goal in Abu Dhabi, gleefully nodding home Khalifa Mubarak’s flick-on from veteran Ismail Matar’s corner. But the Central Asian minnows – making their Asian Cup bow – were spirited throughout and equalised with a magical finish from Mirlan Murzaev in the 26th minute. He collected Akhlidin Israilov’s chipped pass and rounded Khalid Essa before finishing well despite the presence of Mubarak and Bandar Al Ahbabi on the line. Amer Abdulrahman’s brilliant lofted pass was finished emphatically by the lethal Mabkhout but Kyrgyzstan, who threatened on several occasions to force a second equaliser, did so through Tursunaly Rustamov’s scrambled stoppage time header. But the UAE and Khalil held their nerve set up a quarter-final with reigning champions Australia. There’s long been talk of an impending move to the football heartlands of Europe that never feels like it will happen for Mabkhout, but much like celebrated compatriot Omar Abdulrahman, he possesses the talent to thrive at a much higher level. He is a plunderer of goals and has a rare knack to make it look so natural. In a tense knockout game, with the burden of hosting upon their shoulders and being given a stern test by lowly opponents, to take a difficult pass as he did with consummate ease and effortlessly strike the second goal was not even surprising. He made it look easy. His part in the second was less stellar as he fell in the box, but his presence caused a stir and resulted in the referee pointing to the spot. No sooner had Mabkhout produced what looked like the winner, he then contrived to waste a couple of guilt-edged chances to kill off Kyrgyzstan. After victory was snatched from them at the end of normal time, extra time could have begun with a bang when he latched onto a long throw that was not dealt with by the flimsy Falcons’ defence. He was bearing down on goal and he rarely misses these sorts of chances – but not only did he not score, he completely ballooned his shot over. He also had another, more difficult, chance soon after but uncharacteristically miscued again. A couple of uncharacteristic misses robbed Mabkhout of a possible hat-trick, but he played his part in two goals. His finish for the UAE’s second was typically lethal and even though his tumble for Khalil’s winning penalty was dramatic, it will count as a key contribution to securing the Whites’ place in the last eight. Takehiro Tomiyasu belied his 20 years as he towered above the Saudi Arabia defence to nod home the only goal of the game as Japan edged into the Asian Cup quarter-finals. The centre-back, who plays with Sint-Truiden in Belgium’s top-flight, was winning only his sixth cap in the pressure cooker environment of Asia’s premier competition, but seemed at ease in the heart of an at times under siege Samurai Blue backline, alongside Southampton stalwart Maya Yoshida. Here we take a look at a supremely mature performance from the rising young defender. 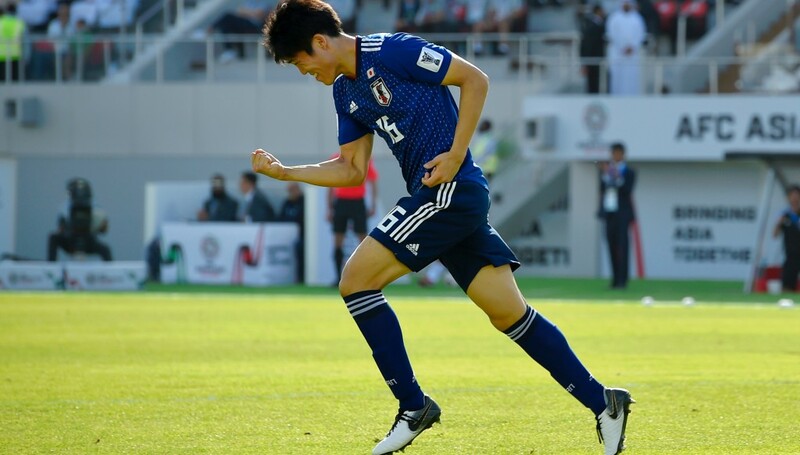 After a flying start from the Green Falcons, the vociferous Saudi support was stunned into silence in the 20th minute when Tomiyasu rose unopposed to nod Gaku Shibasaki’s corner back across goal and into the bottom left corner of the net. Saudi stopper Mohammed Al Owais watched helplessly as a bright start by the Gulf giants was undone. After that, Saudi’s surging start subsided and they resorted to hitting it long, which only played into Japan’s hands. Most of the chances fell to men in white shirts but they could not capitalise on their sights of goal as the four-time Asian Cup champions defended heroically, setting up a last eight clash with Vietnam. Tomiyasu only left his teens behind two months ago, but against one of the favourites for the trophy in the UAE, in the high-pressure environment of a knockout game, he was unflappable. He had Samurai Blue stalwart Yoshida – who is closing in on a century of caps – beside him, and the pair were commanding as they withstood a barrage of Saudi crosses and long balls. If you aren’t a regular watcher of international or Asian football, you might have had trouble pointing out which of the centre-backs was the green rookie and who was the seasoned veteran as Tomiyasu looked like he had been playing at this level for years. In a back four containing Yoshida, 28-year-old Hiroki Sakai and Yuto Nagatomo, Japan’s sixth-most capped player of all time, Tomiyasu truly looked like he belonged. Japan saw precious little of the ball during the 90 minutes – just a paltry 27 per cent to be precise. When they did have possession it was more often than not hacked clear in search of their rapid forwards, who fed largely off scraps. They completed just 39 passes in the second half of this game; 275 fewer than Saudi’s 314. Tomiyasu recorded the second most passes in a blue shirt (25, only goalkeeper Shuichi Gonda made more). But the young centre-back’s woeful pass accuracy of 52 per cent was the fourth worst of his team. Yes, Japan were happy to keep Saudi at arm’s length and they never seriously looked like conceding, but he will need to improve his distribution if he to thrive at the top level. Takehiro Tomiyasu scored the all-important goal in Sharjah. You’d forgive Tomiyasu for being a little overawed on this big stage, but he was bold and brave. At one stage of the second half he pilloried a team-mate for not tracking a Saudi player from a free-kick which led to a chance. As Saudi resorted to pumping long balls up to Salem Al Dawsari or for Fahad Al Muwallad to chase, it was bread and butter for Tomiyasu and his experienced captain Yoshida. This was a performance of maturity beyond his years. And at just 20 he could have a long future at the elite level ahead of him.